Working as a professional trucker has plenty of perks. Travelling the open road from coast to coast to deliver ingredients and food, materials for manufacturing, consumer products, and other kinds of goods can be a great way to see the best of sites in the country and meet wonderful and interesting people. But life on the road isn't all sunsets, laughs and inspiring landscapes. Like other types of businesses, the trucking industry is undergoing significant changes in order to do more with less and stay profitable, and many of these changes are not making life easier for truckers. In addition, the road is also filled with more violence and unpredictable behavior than most other workplaces. So the next time you find yourself getting upset by a truck on the highway â€” whether you're driving to work or headed to your fabulous vacation destination â€” take a moment or two to think about the day-to-day realities that professional drivers are trying to manage. If you're like most people, you probably have no idea what's going on as truckers navigate their workplace to ensure your store shelves are stocked with all the stuff you need for your office, your home and car, and even your beach vacation or long-awaited ski trip. Here are the issues that matter far more to truckers than the middle finger you show them when you finally get around to passing them. New regulations limit drive time, trucker pay. New federal regulations went into effect on July 1 in order to combat driver fatigue and improve the health of drivers and road safety. But the immediate, real-world impact on drivers is a reduction in number of miles travelled â€” and thus pay, because many trucking companies pay drivers by the mile. That is, the new regulations reduce the number of hours a trucker can drive in a week and require drivers to take a 30-minute break after every eight hours on the road. According to Fox Business, Lyndon Finney, editor of The Trucker, predicts that these required breaks will greatly affect driver productivity and wages. "By the time a driver pulls off an interstate, finds a parking space, gets parked, waits the 30 minutes and gets back onto the road again, 45 minutes to an hour has likely passed. That means losing around 45-50 miles a day, multiply that by five or six, that's 300 miles and for drivers paid by the mile, the financial implications are huge." Fleet managers monitor driver performance. If you're thinking you'd just speed up to clock more miles in the shortened window of time, think again. Many companies that rely on fleet performance have installed Electronic On Board Recording Devices (EOBRs) in order to monitor a vehicle's location, how much time a vehicle spends driving, the number of miles it travels, fuel management and other metrics of performance. Basically, EOBRs are designed and used to maximize driver and vehicle efficiency. They also eliminate the paper logs that drivers have traditionally maintained and thereby enhance the accuracy of driver records. As an added bonus, EOBRs can help truckers find optimal routing information and alert drivers to take required breaks. The benefits of EOBRs are terrific for regulators, law enforcement officials, trucking companies and fleet managers. But these onboard devices make it impossible for drivers to speed to make up for lost time or drive just a little longer than the rules dictate in order to arrive at their destination after sitting in traffic. This can impact perceived job performance due to factors out of a driver's control, which can be frustrating to hardworking truckers. Day driving means truckers must work in amateur traffic. Another component of the new regulations is that drivers must take a 34-hour break between ending one 70-hour work week and beginning another. This 34-hour restart must include two four-hour periods between 1 a.m. and 5 a.m., which means that truckers now do less night driving and deliveries. Forcing more commercial driving to happen during the day means that casual motorists and trucks must get better at sharing the road. If you've ever driven a vehicle on a public roadway, then you know that the habits of many amateur drivers are terrible. Yet what's annoying to the typical driver is a daily issue with major financial, professional and safety implications for professional drivers who must deal with inconsiderate and dangerous drivers all day every day. Seclusion, infrequent potty breaks and odd mealtimes can wreck driver health. Truckers work long and often-unpredictable hours; they spend a lot of time alone and must self-motivate to ensure they comply with regulations and stay profitable. This is a job that requires the utmost flexibility and ability to adapt to factors outside of the trucker's control. 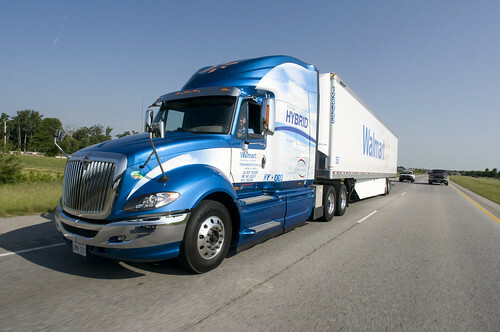 For instance, because truckers depend on other people to complete their work (such as dock workers loading and unloading materials, and mechanics completing vehicle maintenance), commercial drivers must be able to adapt their own work schedule adequately to perform the transportation job in a certain timeframe. Sometimes situations caused by other people require truckers to postpone restroom breaks and work through mealtimes and regular sleep times to get a load from one point to the other in time to be processed during the destination's working hours. The health consequences of these work realities can include back pain; bowel, prostate, kidney, and digestive problems; migraine headaches and hypertension; and even sleep disorders and depression. Risky working environment can threaten driver and cargo safety. Working as a trucker isn't always as carefree as it may seem. Sometimes weather is hazardous, and drivers need to know when to stop to ensure their own safety and to protect other motorists and their cargo. Yet impromptu stops due to weather, vehicle breakdowns or mechanical problems, required breaks and other issues mean drivers must park in less-than-ideal or outright dangerous areas. Especially at night, parked truckers face potential robbery, violence and even murder. Even the best truck stops are often crawling with prostitutes, cons and destitute people. Safety is a monumental concern for many truckers. So the next time you're inconvenienced a bit by a trucker, take a deep breath and remember that they, too, are just trying to get though the day and get the job done. Relax and give 'em a brake. cassalynne is author at LeraBlog. The author's views are entirely his/her own and may not reflect the views and opinions of LeraBlog staff.